Bing Maps provides a world map that users can directly manipulate to pan and zoom. To make this interaction as fast and responsive as possible, we chose to pre-render the map at many different levels of detail, and to cut each map into tiles for quick retrieval and display. 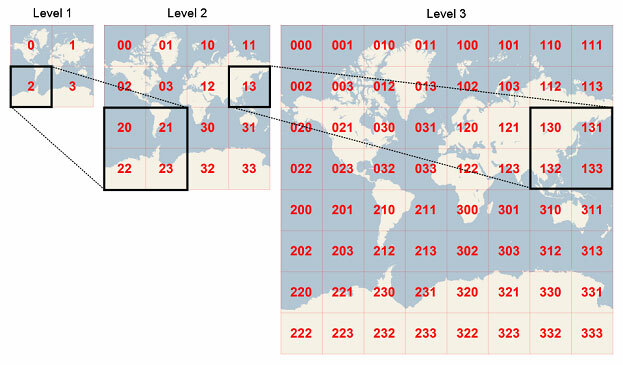 This document describes the projection, coordinate systems, and addressing scheme of the map tiles, which collectively are called the Bing Maps Tile System. It’s a conformal projection, which means that it preserves the shape of relatively small objects. This is especially important when showing aerial imagery, because we want to avoid distorting the shape of buildings. Square buildings should appear square, not rectangular. It’s a cylindrical projection, which means that north and south are always straight up and down, and west and east are always straight left and right. Since the Mercator projection goes to infinity at the poles, it doesn’t actually show the entire world. 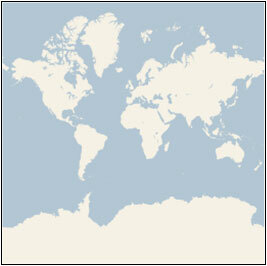 Using a square aspect ratio for the map, the maximum latitude shown is approximately 85.05 degrees. To simplify the calculations, we use the spherical form of this projection, not the ellipsoidal form. Since the projection is used only for map display, and not for displaying numeric coordinates, we don’t need the extra precision of an ellipsoidal projection. The spherical projection causes approximately 0.33% scale distortion in the Y direction, which is not visually noticeable. The latitude and longitude are assumed to be on the WGS 84 datum. Even though Bing Maps uses a spherical projection, it’s important to convert all geographic coordinates into a common datum, and WGS 84 was chosen to be that datum. The longitude is assumed to range from -180 to +180 degrees, and the latitude must be clipped to range from -85.05112878 to 85.05112878. 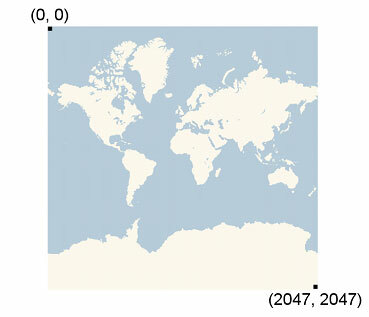 This avoids a singularity at the poles, and it causes the projected map to be square. Finally, quadkeys provide a one-dimensional index key that usually preserves the proximity of tiles in XY space. In other words, two tiles that have nearby XY coordinates usually have quadkeys that are relatively close together. This is important for optimizing database performance, because neighboring tiles are usually requested in groups, and it’s desirable to keep those tiles on the same disk blocks, in order to minimize the number of disk reads. The following sample C# code illustrates how to implement the functions described in this document. These functions can be easily translated into other programming languages as needed. //     Copyright (c) 2006-2009 Microsoft Corporation. All rights reserved. /// Clips a number to the specified minimum and maximum values. /// latitude and level of detail. /// into pixel XY coordinates at a specified level of detail. /// into latitude/longitude WGS-84 coordinates (in degrees). /// of the specified tile. /// Converts tile XY coordinates into a QuadKey at a specified level of detail. /// Converts a QuadKey into tile XY coordinates. Joe Schwartz is a software architect for Bing Maps.